Have you ever try baking with the frozen Paratha? If not, you should because it is really easy. I find it much tastier than puff pastry and less fat. 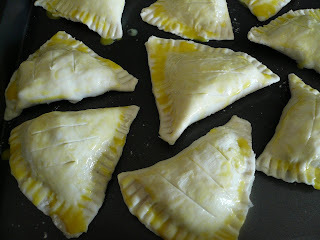 I hardly use puff pastries because of the amount of butter in it. 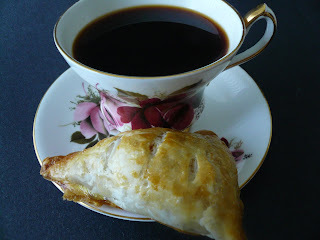 This little puff is really good for afternoon tea , party food or snack for children. Is really easy to make. Do give it a try. Brush the puffs with egg and bake in a pre-heated 350 degree F until golden brown. Note : You can used any kind of filling for this puffs. 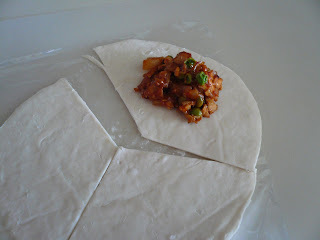 It can curry puff filling, char siew filling or even tuna and sardin filling. Make sure you dust the counter and your fingers with some flour before handling the pastries because it can get quite sticky. 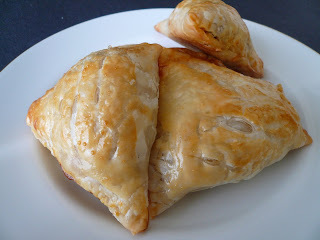 Is this the same pastry that you made curry puff with? I tried to find it in the frozen section a few time but to no avail. wow! you have a very fantastic idea here!! It's never cross my mind in thousand year.I try to make puffy pastry skin so many time but each time turn up:(.I have 2 packets of paratha skin,sitting months in fridge Thanks for sharing:).I really love your creative way.Safe work and time.I'm sure going to try it soon. I know Richmond have a Indo-Pak store.Go there to find paratha,roti puri,chapati,spices and alot more.I love Indo -Pak store bcoz it carry items that we asian can use in daily basic.Just google and the address pop up. 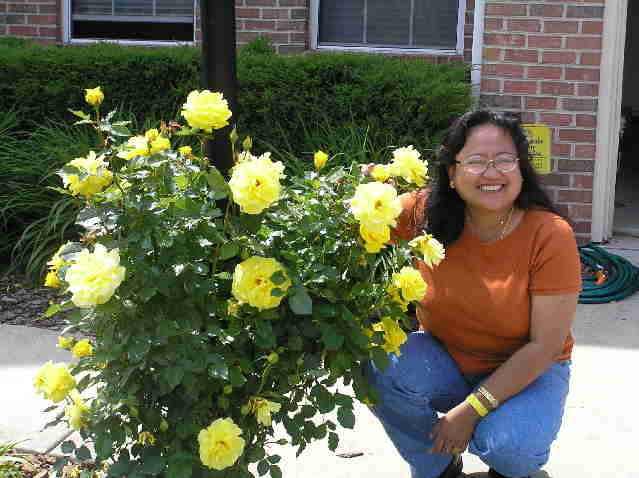 Lesley, you can do a lot of things with this. Sometime I roll it up with sausages. I am sure Mishu and Elliot would love it. Hey that is something new. I never thougt of using that for a wrap. This is great! I have just bought Kawanku roti canai yesterday from the Indian store. I can try your recipe. Thank you for sharing. adui.. like this also Gert can think off. hahaha. Good idea. I always buy this paratha and just eat with curry and my kids with their sugar.. but to think of making puffs.. that's a first. I MUST TRY this. Thanks Gert, very creative of you. Nonya, you are most welcome. Zue, bila buat ni. This weekend? Jane of all trades, I am sure your kids will like this. you are soo pandai la!! kawan is by far the best frozen roti canai! I should find this. Hopefully, I can find it in Turkish store. Zaza, I tak pandai. Just trying to find new ways of cooking it. Retno, I hope you find it too. Very creative of you, Gert. The baked roti looks like short crust pastry which I like. :) Thanks for sharing yet another great tip. Thanks for sharing the recipe Gert :) I've made them today for hubby's birthday .. hehehe .. LOVE it! 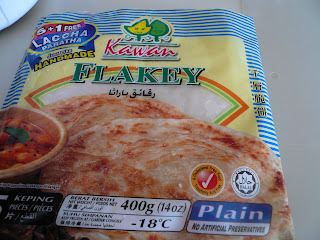 like this kena stock up on my kawanku roti pratha! thanks for the tip gert. Rita, this pastry taste more like puff pastry than shortcrust pastry. Envy, I am glad your family enjoyed it. Pearly, you can use any other brand. Looks good. I think Kawan is a good products. I met up with the MD from Kawan when I was in Germany. They have a big market for importing it out to western country. You are so creative! Here in France I can get this frozen roti canai, imported from Singapore. Sue, here we are able get all kinds of Kawan brand paratha. Finally, I found Paratha bread. Yesterday, I made some Paratha puff using different fillings. My hubby loves it. Thanks for a great idea. Zoe, you are most welcome. I made this and brought to a birthday party yesterday and it was a hit. :-) Everyone loves your paratha puff. Just want to say thank you for a wonderful recipe and so easy to make.